Steve Bloom is a vibrant and entertaining public speaker on issues related to wildlife, travel, the environment and documentary photography. Hear him describe his diverse encounters which include swimming underneath an elephant, being charged by a wild rhinoceros and photographing in one of the world's deepest gold mines. His speaking engagements are accompanied by stunning imagery as he recounts his experiences travelling to all the world's continents. A prolific author of photography monographs as well as children's books, now in over seventy editions, he tailors his talks to suit a wide variety of audiences. At the age of forty, Steve Bloom gave up a lucrative career providing photographic services in London and chose instead to travel the world documenting the planet's endangered wildlife. It seemed like a crazy idea at the time, making no business sense, as no bank would offer a loan for such a seemingly frivolous exercise. He was strongly advised by his doctor not to take the risk, given the inevitable strain on family life. It was a great challenge in lateral, creative thinking which untimately paid off. He was able to balance family life with travel and sell the pictures for a decent income. With his wife, Kathy, he founded a photo library to fund the family, books and photo shoots. He lectures at venues such as the Edinburgh Book Festival, Oxford Literary Festival, The Guardian, The Royal Geographical Society, The Natural History Museum, Travellers Tales Festival, Bath Festival for Children's Literature, The Durham Book Festival, BJP Vision, Adventure Travel Show, Edinburgh Science Festival, Chichester Festivities, Focus on Imaging, Wild Photos, York Festival of Ideas, Cheltenham Literature Festival and London's Kings Place. 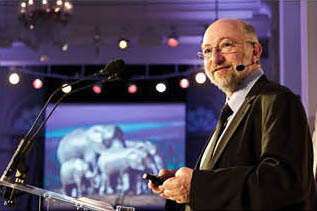 Bookshops such as Waterstones, Blackwells, Stanfords and Borders have hosted his presentations. 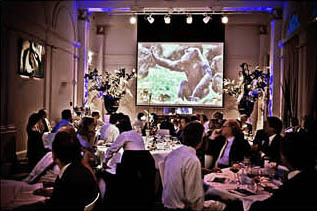 Charity events include after dinner speaking for the WWF, Save the Rhino and PhotoVoice. Corporate presentations include a show for Canon Europe where he gave a keynote presentation to 100 international photography journalists who were flown to a camp deep in the Kenyan bush. Imagine the wildlife watching from the sidelines! Contact us to discuss availability and prices. Join best-selling author and photographer Steve Bloom as he journeys through the essence and diversity of Africa. Hear the stories behind the creation of his books Living Africa, Elephant and Trading Places – The Merchants of Nairobi.. Steve shares with the audience this extraordinary continent; through landscapes from desert to jungle, dynamic wildlife, and human life from remote villages to teeming metropolis. Witness silverback mountain gorillas deep in the rainforest; endangered black rhino drinking at a moonlit waterhole; remote cultures in Ethiopia's Omo Valley; Mozambican migrant workers toiling in a gold mine three kilometres below ground; and fishermen on the Niger River. In this unforgettable event, Steve captures the diversity of the continent where he grew up, and where he has felt compelled to return throughout his life. Join best-selling author and photographer Steve Bloom as he shares his experiences photographing endangered wildlife on all the continents. How do you get close to a grizzly bear? How should you behave in the presence of a gorilla? What’s it like being charged by a rhinoceros? He creates photographs that acknowledge the common threads linking all us all, blurring the lines between living beings. His adult and children’s books have been published internationally in twenty-one languages; and his giant outdoor exhibitions, seen by an estimated ten million people, play an important role in raising awareness of environmental issues. Tailored specially for children and families, this presentation is both informative and entertaining. From the African plains to the frozen Arctic, internationally bestselling photographer Steve Bloom’s celebration of animal families is both a feast for the eyes and a fun-and fact-filled event for all the family! Why do hippo families like to wallow in mud? How do adult polar bears keep warm? What do giraffes sound like? An event full of amazing pictures and entertaining animal facts! Steve has had seven chidren's books published. Steve Bloom discusses his 1970s documentary work and the political situation in South Africa at the time and how it shaped his later career. His images of apartheid-era South Africa reveal the alienation of a country on the brink of change—placing Bloom among a select few photographers in possession of the combined boldness and sensitivity of vision necessary to effectively capture the mood and charged racial climate of the time. The exhibition, Beneath the Surface: South Africa in the 1970's, was first shown at The Guardian Gallery in central London for the London Festival of Photography. Selected press features include: BBC audio slideshow,The Guardian and The Observer. Saturday and Sunday 27-28 July - Africa - TRAVEL PHOTOGRAPHY LIVE, RGS, LONDON. Thank you so much again for delivering a thoroughly engaging lecture. It was our biggest turn out at Kings Place to date! We had an excellent response from the audience. Everyone at PhotoVoice is delighted with how the whole evening turned out, and we can’t thank you and Kathy enough for making the special journey down and kindly offering your time. Your presentation was fascinating, and was a multimedia treat! It was fantastic to see your photographs on the big screen – and I am really impressed with your use of digital imaging and 3D effects. Thank you both for a wonderful evening at Kempston. The beautiful selection of images captivated the audience, and can only have endeared them even more to Steve's work. In a world where self-publicity and ego appear to rule, people were also refreshingly surprised by Steve's un-assuming and modest manner. A true diplomat for his cause! I've already received a number of e-mails asking me to pass on thanks, and that list will grow significantly I'm sure. Several people said they appreciated the welcoming way in which you handled the book sales, feeling that they were able to look, and ask questions, without being under any pressure. Overall then, it was a wonderful combination of stunning images and an amiable and committed presenter, that will ensure the event stays in the mind of all the audience for years to come. It was a great pleasure having you speak at the fundraising dinner. There are times that you want something badly to happen. You appearance was one of these occasions. All the guests present loved your work and the stories that accompanied them. Thanks for a great evening. I was so impressed with the quality of your pictures, that I felt compelled to buy the heaviest book in the world! It's just page after page of award winning studies any of which I would be delighted to have taken. You are the first person to demonstrate the really true feeling and atmosphere of the animals and their surroundings combined with stunning detail to composition. A big thanks for the work you are doing. Yesterday evening was a wonderful success, and your presentation was amazing. The audience was so complimentary, and the queue for the books spoke for itself! It was an absolute pleasure to host you here, and to meet both you and Kathy last night. Thank you very much for being such a lovely guest at the Blue Fin.